Our company is delighted to bring you Home Decor and Gifts. We have such a great selection of Medieval, Fairies, and Renaissance Home decorations. Here we have animals statues, art work, ashtray, lighter, bookends, bookmarks, books, calendars, postcards, candle, candle holders, chairs, thrones, clocks, coasters, paperweights, hybrid armor, fairies, green man, hangers, hour glass, incense, burner, key chains, mask, banners, giftware, mirrors, frames, tables and wind chimes to name just a few. Great for Wedding, Birthday or Gift of any kind. If you love animals, this is the place to be. See all the animal statues we provide for your collection. We are proud to display and sell Paintings and Art Work. This Art Gallery sells Medieval art prints, Civil War Prints and Military Art. Here we provide you with many types of Ashtrays, Lighters, and Cases that you never thought of. Imagine what you can find for bookends. You'll never know unless you come in. We have many books of medieval interest. Call us if you have any requests. Great for storing away your magical amulets, talismans and charms, these Boxes, Chests, and Cupboards are also great places to tuck away your favorite jewelry and ritual components. Candles, Candle Holders, and Candle Accessories of all kinds: Wax and Soy candles, scented and unscented, Candle holders for all types of candles, candle snuffers, and more. Commonly used within ritual magic, the Chalice is frequently viewed as a tool that represents the Feminine Divine, and through ritual is sometimes used in symbolic representations of creation and fertility. We are proud to present to you the one of a kind clocks. We carry all kinds of coasters. Come in! Here we have Ancient Egypt, Angels, Dragons, Fairies, Gargoyle, Mermaids, skulls, Wizard and so many more. Decorative Hybrid Armor - Museum Quality Armor and helms from Hybrid Polyurethane for Display and Decoration! 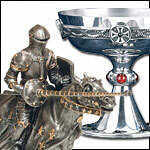 Please enter here to find Angels, Goddess and God Statues, Plaques, and Altar sets. Fairy Collectibles come in many forms including fairy figurines and ornaments. We have many beautiful fairy figurines that range in size. Gargoyle Statues of all kinds. Found in many cultures around the world, the Greenman is often related to natural vegetative deities springing up in different cultures throughout the ages. The collector's favorites are the decorative hangers. Our Incense, Burners, and Charcoal are available in hundreds of different fragrances coming in stick, cone, powder, resin, and granular form. Need a Mask? You've come to the right place. Four Foot Tall Silk Screened Medieval Banners and Historical Banners. From Wall Mirrors to hand mirrors to accent any room. They are wonderful gifts. We have Model Pirate ships, Model Tall ships, Model Sailing Ships and Model Viking ships to choose from. A great nautical accent to any room. Sold fully assembled. With our Nautical Decor section you can decorate any room or house to fit your seaworthy ideas and dreams. These pictures are beautiful on any table. We have dragon frames and many more. Sandtimers are a great collector's item. The are rarely made. Need a wall Decorated? You'll find all that you need right here. Come on in! Enchanting Water Globes and Crystal Balls will last forever. Wind Chimes are so beautiful to hang outside. Come in for Quills and ink, pen toppers, notepads, paper, and journals.